Starting May 10th, 2017, if you own a business in the vape, e-cig, vaporizer, or e-juice industry, major US banks may no longer want to work with you. Well, not you specifically, but any business selling vapes (dry herb or juice). The entire vape industry is being given the cold shoulder by Fifth Third bank, among others. Entrepreneurs with businesses in the vaporizer industry are no stranger to challenges. On August 8th 2016, new FDA requirements were implemented to regulate vaporizers in an effort to curb the sale of these products to any underage consumers. In addition to sweeping changes to how these products could be sold in brick-and-mortar stores, the regulations also created many additional hoops to jump through for any vape business selling online. Check photo IDs of everyone under age 27 who attempts to purchase e-cigarettes or other ENDS (Electronic Nicotine Delivery Systems). Only sell e-cigarettes and other ENDS to customers age 18 and older. Do NOT sell e-cigarettes or other ENDS in a vending machine unless in an adult-only facility. Those requirements were only the beginning, and banks began to write their own policies based upon the new regulations. 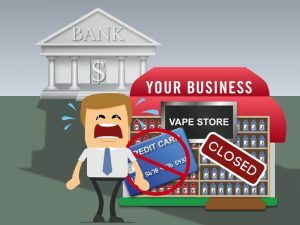 In light of the increased scrutiny, a large number of banks made the decision to no longer support the sale of vaporizer products, and business owners found themselves left high and dry with little to no warning. Vape companies cannot sell or distribute e-cigarettes or other ENDS without a health warning statement on the package. Vape companies cannot display advertisements for e-cigarettes or other ENDS without a health warning statement. With all of the scrutiny and challenges business owners face when selling these products, Easy Pay Direct has stepped up our efforts to support these merchants. We have spent considerable effort in negotiating secure processing arrangements that will allow the entrepreneurs we work with to sleep soundly at night without a very real concern that they will wake up to a notice that their business is no longer able to accept payment. 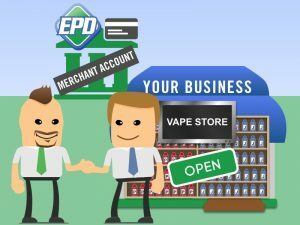 If you are selling vaporizers and have a concern about whether or not your business is at risk, or want a reliable merchant account provider: call our team of experts and we will be happy to do what we can to make your life easier!